Gift of Power | Speaking of Jesus? Reading, writing, thinking and speaking about Jesus and his way. Actually, what Andy has written in Playing God is even more beautiful. So by way of disclaimer, if my comments below make his work seem less than amazing, disregard my notes and go straight to the book. For me, this book was transformational. In truth, my own take on power has been deeply conflicted and inconsistent for a long time – probably as long as I can remember. Despite reading and reflection – I’ve read any number of books about power & influence, studied with leadership thought leader Ron Heifetz at the Kennedy School, and even preached on this theme – I’ve been unable to overcome a profound tension. On the one hand, I’ve understood Jesus, whose life and teaching has always seemed to me one big invitation to lay down power and embrace the way of the cross. On the other hand, I work alongside students, professionals and faculty who are engaged in the academic enterprise at one of the most powerful academic communities in the world – followers of Jesus who want to USE their power in ways that faithfully express the way of Jesus. So, in Tony’s economy (and in my own understanding for as long as I can remember) love and power cannot coexist peacefully – in order to love one had to lay down power. It is love OR power – it is binary. For Tony, at least in his writing, there was no recognition that love might not just coexist but be expressed through power. For him the only way to love is to renounce power. To be sure, Andy does come back to the abuses of power (playing a false god) later in the book. But first he writes expansively about the amazing gift of power and this was where my own view began to be transformed. While he recognizes that the Bible isn’t a handbook about power, Andy invites us to bring our questions to the text and the God who speaks there, “asking,” as he says, “the Bible to form our imaginations about power” (p. 12). When he does this, it gives us permission set aside poorly integrated ideas about what power is and what it means to live with it faithfully. Asking us to read the whole Bible – including the first two chapters of Genesis and the last two chapters of Revelation, referring to the resurrection of Jesus as “the most audacious act of power in the history of the world” (p. 25). For Andy, “power is the ability to make something of the world” and to interpret and give it meaning (p. 17-18). Power isn’t just destructive or coercive – it is creative. And when it is used well, it multiplies and creates more power for others. In fact, this is one test of power’s legitimacy: “when one person or group of people acts to deprive another of power, and especially when that pattern of exclusion persists from generation to generation—then something has gone fiercely wrong… true power multiplies capacity and wealth…” (p. 19). “Power is for image bearing and image bearing is for flourishing” (p. 54). Idols are what people come up with when they misuse their creative power. They are objects made without reference to the truth of God and his character. They claim – apart from God – to have the true interpretation of reality. Injustice is the practical outcome of idolatry since the idol has been substituted for the image of the true God. “God hates injustice and idolatry because they are the same thing… Whether making false gods (idolatry) or playing false gods (injustice) the result is identical—the true image of God is lost…” (p. 71). Andy’s description and illustrations relating idolatry and injustice were the clearest and most persuasive explanations I’ve read. I’ve gotta say that this language isn’t what I would have chosen – it makes me nervous. For Andy “Playing God” is not just a critique of those who would misuse power as false gods. 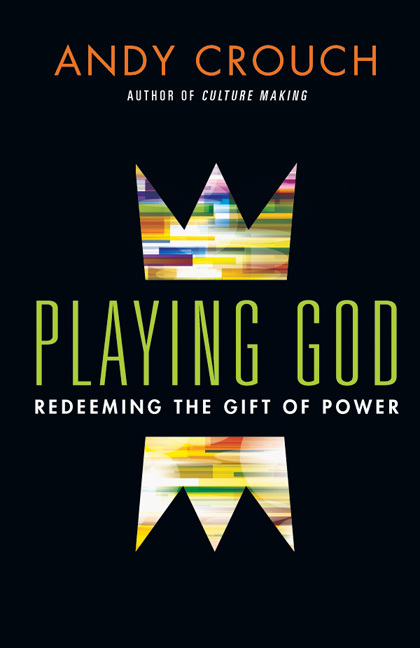 It is his invitation to the followers of the true God to – by grace – live as Icons – to “play God” – bearing God’s true image and exercising power for flourishing (p. 87). It is “the ongoing benefits of past successful exercises of power”(p. 150), and if we take the model of Jesus, is to be spent rather than conserved. Andy’s formula for institutions includes what he calls four ingredients (artifacts, arenas, rules and roles) and three generations (founders, children, children’s children). Our role is to function as trustees (p. 213) who neither overplay or underplay their power. His discussion of Martin Luther King and the passivity of white moderates when they could have joined him in his “illegal protests” highlights the fact that institutions depend on the courage and action of people (p. 219). His discussion of gleaning and it’s application in modern settings to margins, the economy and power in general is a marvelous if improbable response to shareholder demands and personal ambition to claim all the value (p. 248). So by Fr. Rohr’s account I still have time for our two boys at home. I guess what I want to know is whether it’s too late to catch them if they’re already here at graduate school. 2. I know he only gave it one paragraph, but I’d like to hear more about why Andy so quickly writes off the community organizing approach of Saul Alinsky, calling it “zero sum.” What about times when the broader society has made peace with intrenched injustice? And what about situations where laws and other institutions align themselves symbiotically with the injustice of the root institution. Surely there are times when the coming together of the poor and dispossessed to organize themselves is a good use of power? What about the American Revolution? Or the ANC in South Africa? Are some institutions not meant to be torn down? Each spring prior to Commencement the InterVarsity Graduate & Faculty Fellowship at Harvard gathers to bless and pray for dozens of students, commissioning them at our Ordination to Daily Work. Previously on these occasions it has seemed to me that the path of faithfulness for these soon-to-be-graduates was to receive the blessing, take the degree and then lay down all the related benefits (aka power) that a graduate degree from Harvard brings with it. Renouncing power for the love of God and neighbor. Now, I and my fellow chaplains will be able to point to a different way – encouraging these graduating friends to lay down their idols and become holy icons whose power and privilege is multiplied and shared and shaped by their journey with Jesus. I can’t wait to tell them about it. As I was finishing these notes I happened to come across six short video clips and one longer one of Andy talking about some of the key ideas in Playing God. These are good. Even more helpful is the longer conversation with John Wilson, Books & Culture (on page 2 of the link above). Interestingly, John says that Andy’s book was transformative for him too. Maybe for you as well?